Beach Day is a garage/surf/awesome band from Hollywood, Florida. They are releasing their debut album, Trip Trap Attack, on June 18th on Kanine Records. Today, Kimmy, Natalie, and Skyler are spending Seven Questions In Heaven with us. Fun, catchy, sunny, beachy, punky. My sister says we're like beachy Ramones with a girl singer! We really love '60s music the most! The Shangri-Las were such badasses. We love Nuggets compilations and Girls In The Garage compilations are amazing. You can find so many great undiscovered bands through those. The Yardbirds are a big influence for us. 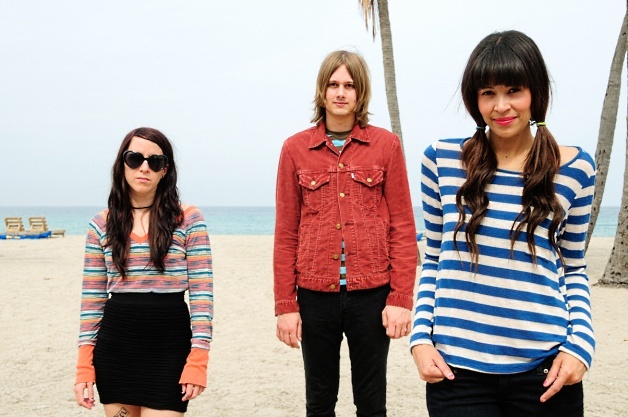 Newer bands that we love are mostly in the same kinda vein like Cults, King Khan & BBQ Show, Dum Dum Girls. Alabama Shakes is great, Vivian Girls and The Like are the best. Tell us about living in Hollywood, Florida and what effect the town has had on your music. Hollywood is like a little '50s beach town. We live like five minutes from the beach. It's super sunny & full of retirees! I think we exist just to bother them! Hollywood does have a long tradition of garage music, so I feel like we're carrying the torch so to speak. Trip Trap Attack comes out on June 18th. Scenario: your favorite rock magazine or website reviews Trip Trap Attack and loves it. How do they describe it in six words or less? Truly distinct, youthful rebelliousness, manic playfulness. Describe your perfect day at the beach. You're the opening act of a music festival. You can get any five artists, living or dead, to perform on the bill with you. Which five do you choose and what song do you all perform as the final jam? The Ventures would go next to get everyone warmed up. Cults would be next! Hole (original lineup) would kill everyone! The Sonics would then go up and slay the crowd. It would be a freak out! The Shangri-Las would headline and we'd all get up together and sing "Twist And Shout!" And Serge Gainsbourg would be DJ'ing in between sets.